Belize NMS: Cool and relatively dry conditions prevail; moisture increases later today. Advisories: A small craft caution remains in effect for gusty winds and occasionally rough seas. 24-hour forecast: Cloudy with little or no rainfall this morning, then a few showers, periods of rain and isolated thunderstorms will develop mainly along the coast and out at sea later this afternoon and tonight. General Outlook: For Sat. and Sat. night: A few showers and isolated thunderstorms over most areas, but especially over inland areas and southern areas. 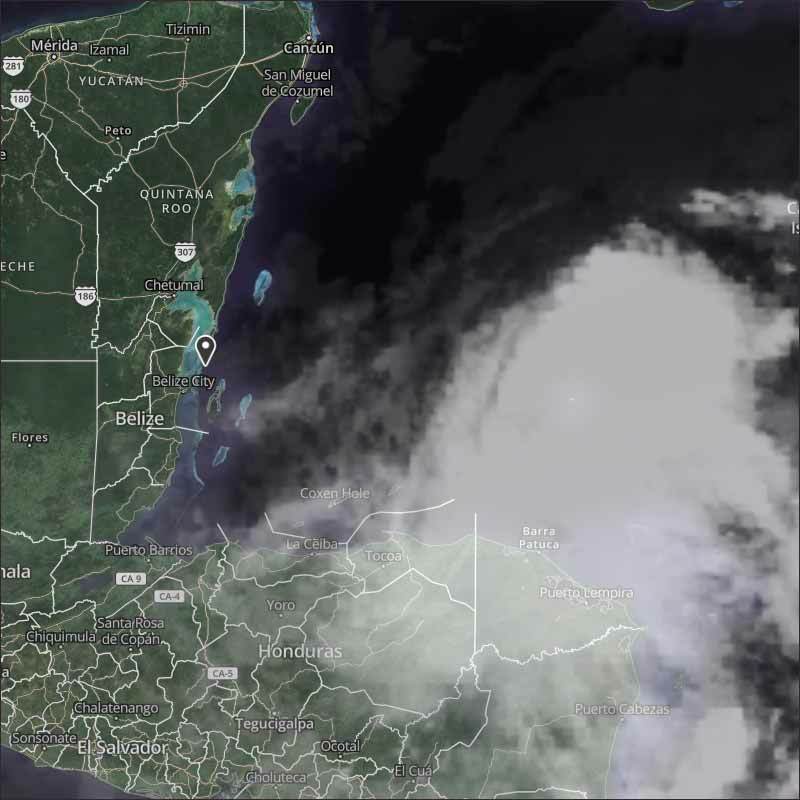 Daily Tropical Weather Outlook: A disturbance over the northwestern Caribbean has a medium chance of becoming a tropical depression during the next 48 hours as it moves northward over the northwestern Caribbean Sea. Today N-NE 10-20 kts Moderate-Rough 6-8 ft LITTLE OR NO RAINFALL, INCREASING LATE. Tonight NW 10-20 kts Moderate 4-6 ft A FEW SHOWERS AND ISOLATED THUNDERSTORMS. Tomorrow 5-15 kts Choppy 3-5 ft ISOLATED SHOWERS OR THUNDERSTORMS, INCREASING. 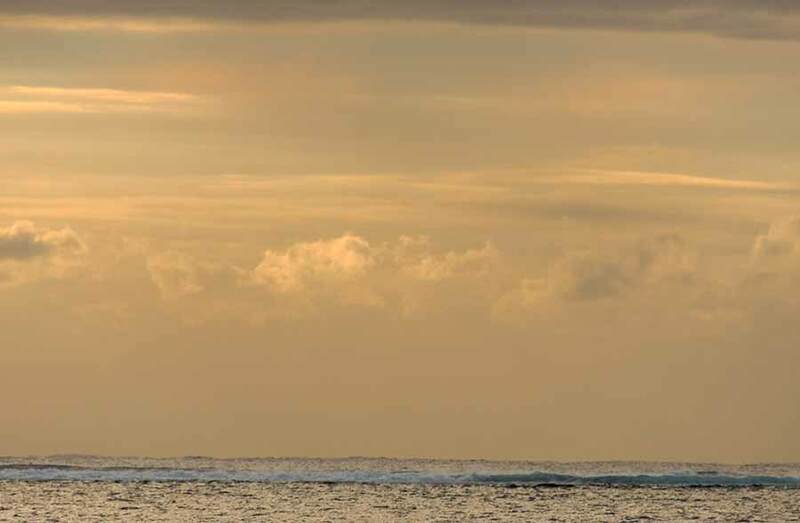 Outlook NW 5-15 kts Choppy 3-5 ft A FEW SHOWERS AND ISOLATED THUNDERSTORMS. On Ambergris Caye this morning it's cool, calm and quiet. No wind is registering at the moment. The sky is clearing and we may have a sunny day ahead. The current temperature is 71 f. at 6:30 am. Today's expected high is 88 f.
The cold air is still with us, but it is starting to be pushed back by the easterly Caribbean winds, the cold air clouds from the NW are now very slow, and will be reversing or replaced by easterly Caribbean clouds later today. But there has been a massive ITCZ swell-up just off the Honduras NE tip, probably made more active by the clash of the cold and warm air masses. This is causing rain, although not a lot, scattered along the Honduras north coast, not far from Belize, some of it is effecting southern Toledo even now. There is some early morning "Tiger" surface wind from the SW, this will stop soon. Looks like today will start off sunny, but then cloud moving in, probably not too much rain. I just do not know what the NOAA weather people are doing. 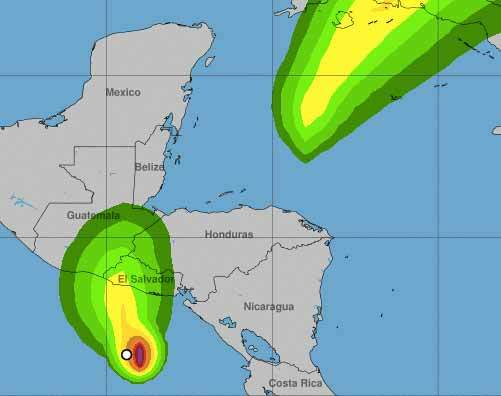 About 4 days ago, they were warning of a 40% chance of a storm developing off Nicaragua, but that went down to 10% and faded out, now they are suddenly saying >60% chance of a Tropical storm (18) and taking off across Cuba, but also showing another one coming up from the Pacific at Belize. 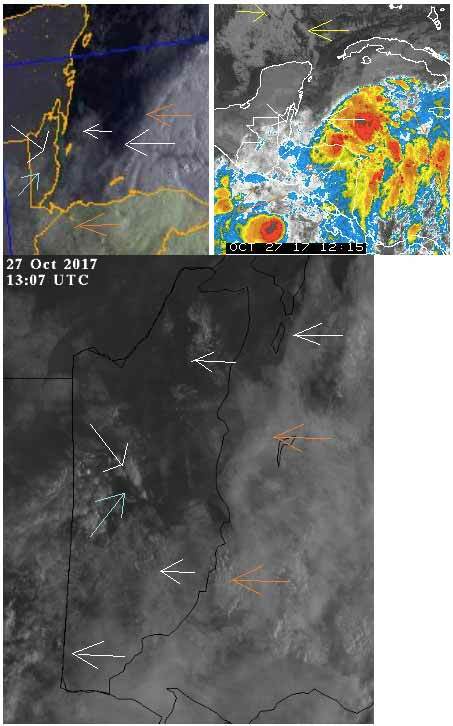 But my mornings cloud picture on the left, shows active ITCZ areas, which have both died down, during the day as I expected. I am getting the impression they might just be guessing. . . If nothing happens, then they can say >60% means a 40% chance nothing will happen. How is this probability is keep changing and out of ITCZ swell-ups, which have been going on in this area for the last 2 weeks. Perhaps tomorrow I will be able to see more. They are now showing a "L" just off Belize, but we had a "L" sitting on Belize since the 20th, the cold air pushed that to the east.